This is the German Hetzer Tank Destroyer's big Swedish brother. It is also known as the Swedish Marder. 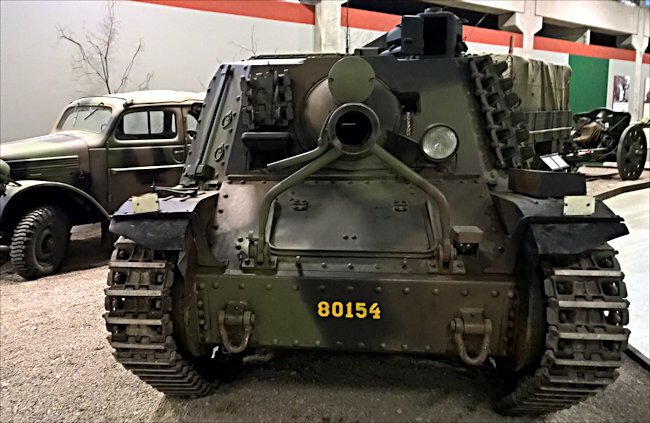 It is based on the same type of Czech designed tank chassis but is armed with a 75mm howitzer that was later upgraded to a 105mm gun. On 27th September 1941 the Swedish Army issued a requirement for the construction of self propelled artillery vehicles that could keep up with the tank and infantry units across country over the Swedish terrain even in the harshest winter conditions. They were required to give close support as well as indirect artillery fire. 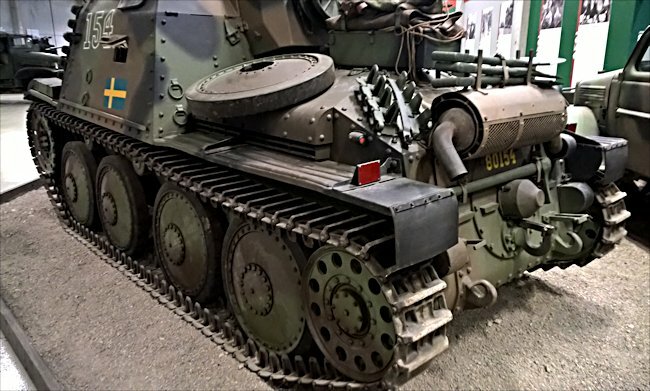 Tests were conducted on different tank chassis as well as types of guns, barrel lengths and calibers. It took a long time. One of the problems of fitting a longer barreled gun to the chassis was that in test it was found that the longer barrel kept hitting tree trunks in the Swedish Forests which hindered laying the gun on target quickly. It would also have meant that a new law would have had to be passed in the Swedish Parliament. The traffic law at that time stated that no part of the vehicle should protrude in front of the vehicle. This is why a shorter barreled weapon was used. In March 1944 the Army finally ordered 36 SAV m/43 self propelled artillery guns from the Swedish tank manufacture Scania-Vabis. This company were already producing Strv m/41 SII tanks under license-built Czech TNH medium tank. They converted the last batch of 18 tank chassis into the new SPGs. The Swedish word Stormartillerivagn translates as storm artillery vehicle: a better translation would be self-propelled assault artilley. They were powered by a Scania-Vabis 603/2 in line 6-cylinder water cooled over head valve engine that produced 162hp. It had a maximum road speed of 28mph (45 km/h) and a 4 man crew. It was fitted with a Praga-Wilson 5-speed preselect gearbox. The armour ranged from 8 to 50mm thick. In total 36 were produced between 1944-1947. They remained in service until 1973. 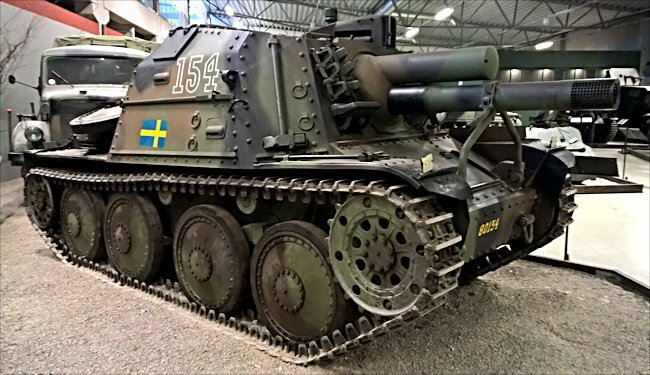 The Swedish Bofors 75mm m/02 gun was fitted to the first 18 SAV m/43 self propelled artillery guns to come off the production line whilst the new Bofors 105mm m/44 gun was being developed. 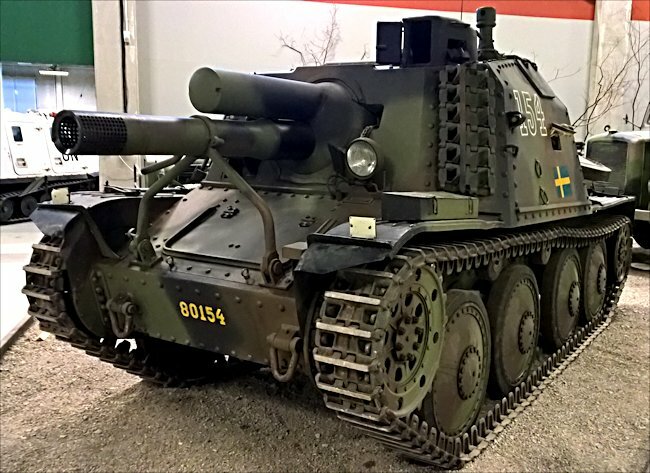 The first Sav m/43 were issued to the Artillery in A9 Regiment at Kristinehamn. Tanks crews to man these new vehicles had already been chosen in April 1944. They started their training on using the 75mm gun whilst for the new SPGs to be delivered. There were problems in the production line which meant they did not arrive until January 1945. The Swedish Army split their new mobile weapons between two Assault Artillery Divisions each with three batteries. They underwent winter battlefield exercises in the countryside around Dalarna in February 1945. The reports from officers involved and some Senior Army Officers were very positive. They were deployed operationally along the Norwegian border until the end of WW2 and the German surrender. After the end of WW2 the Bofors 105 mm cannons became available. The eighteen SAV m/43 SPGs were sent to the workshops to be upgraded. A further order for eighteen more SAV m/43s was placed at the end of 1945. These would also be armed with the new 105mm gun. The final vehicle of this new batch was delivered at the end of 1947. Where can I find preserved m/43 SPGs?